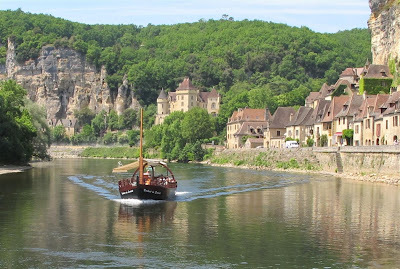 We were back in the bus to a village along the Dordogne river, Roque Gageac, for lunch and to take a scenic boat ride on the Dordogne to see a water's-edge view of the dwellings built right into the cliffs. 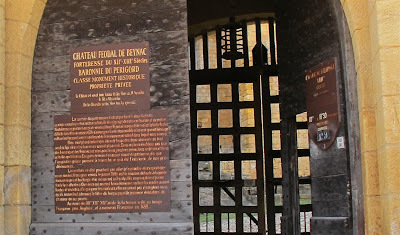 Occupants of the buildings often resided above the ground floors because of the periodic flooding by the Dordogne. The severity of flooding has been attenuated in modern years by dams upstream, but the river is of uneven and uncertain depths, so it is not used for serious navigation and the river tours are taken in flat-bottomed boats called gabares (also gabarres). These motorized craft competed with kayaks and canoes that tried to outrace us on the lazy green water, practicing their seamanship crossing our wake. Lovely, lovely afternoon cruise. 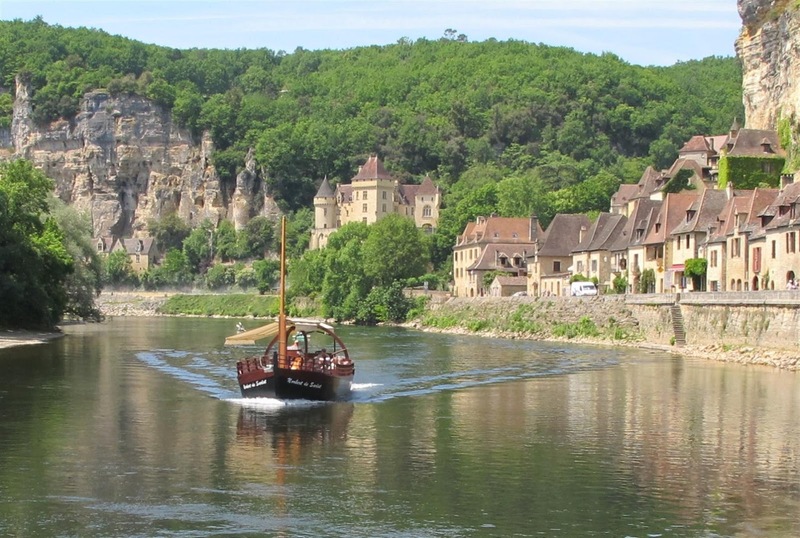 There was still time in our day to take in Beynac, a fortified chateau sitting high atop a cliff, with a village tumbling down the hill below it. We didn't have to climb up (hooray) as we do in most of the "perched villages" of France. Carlos drove us to the top in the bus and we would "walk" down to river's edge to meet up with him again. We had some idyllic vistas from the top. But then the serious part of the walk down to the river to meet Carlos struck us. Walk, my eye! inspecting les pierres dans les murs? Hmmm. Looking a little steeper. 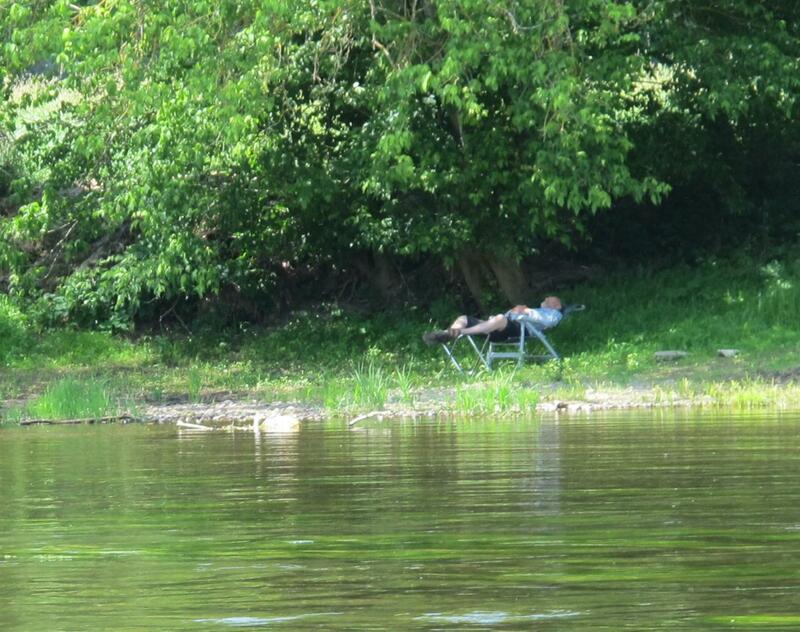 We're at the river. No photos in between. Yes. We "walked" down from up there. Walking wasn't over for the day. We still had a group dinner to go to at a restaurant back down toward Old Town, naturally with a trip up another spiral staircase to the dining room with my trusty walking stick. My thighs stood up to the test of the descent from the dining room after dinner. I took that last step at the bottom soooo carefully. Home free, I thought, until a few steps later, I stepped into space into the "sunken" bar en route to the exit, to the frantic cry of "Attention!" from the bartender. And did a graceful tumble to the floor. Nonetheless, at the end of the day, I exclaimed, "What fun it's been today!" and those thighs are going to toughen up. Love your 'normal' shots but intensely curious about the abnormal ones! LOL! Glad you weren't hurt when you fell. One of our ladies fell at the Biltmore House. She's ok but a swollen knee prevented more touring for her. It looks like you are enjoying perfect weather. I hope it holds out for you. Thanks for sharing all those great photos.